MOSCOW, July 27. /TASS/. 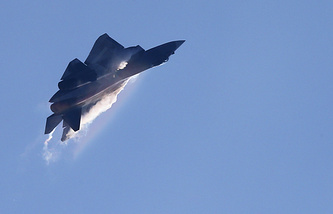 Russia’s sixth-generation fighter jets will be furnished with lasers capable of physically burning an enemy’s missile homing heads, Adviser to the First Deputy CEO of Radio-Electronic Technologies Group (KRET) Vladimir Mikheyev told TASS on Thursday. Russian Vice-Premier Dmitry Rogozin announced in March 2016 that Russia had started work on an advanced fighter jet. KRET is developing onboard equipment and electromagnetic weapons for future fighter aircraft on its own initiative. "We already have laser protection systems installed on aircraft and helicopters and now we are talking about developments in the field of powered lasers that will be able to physically destroy attacking missiles’ homing heads," the adviser said. "Roughly speaking, we’ll be able to burn out ‘the eyes’ of missiles that ‘look at us.’ Naturally, such systems will be installed on sixth-generation aircraft as well," he added. KRET currently supplies President-S onboard defensive aids systems, which include a laser station of electro-optical suppression. With its interference, suppression and flares, the President-S causes an enemy’s missiles with various homing heads to fly past aircraft and helicopters. In addition to electromagnetic guns, the Russian sixth-generation fighter jet will also get guided electronic munitions, the adviser to the KRET first deputy CEO said. Sixth-generation fighter jets will perform ‘formation’ flights where one or two manned aircraft will fly alongside 20-30 drones that will be capable of carrying any weapons, Mikheyev said. "One drone in a formation flight will carry microwave weapons, including guided electronic munitions while another drone will carry radio-electronic suppression and destruction means and a third UAV will be armed with a set of standard weaponry. Each specific task is solved by different armaments," he said. The KRET adviser didn’t specify these guided electronic munitions or the mode of their operation. As Mikheyev earlier told TASS, the unmanned variants of the sixth-generation combat plane will be armed with electromagnetic (microwave) guns. As the KRET adviser explained at that time, a microwave gun focuses and redirects electromagnetic radiation that heats up an object, for example, an antenna, and physically destroys it. The size of a ‘formation’ flight may be adjusted when work with real prototypes begins, the KRET adviser said. It is the unmanned version of the sixth-generation fighter jet that will be able to carry electromagnetic guns or microwave weapons, Mikheyev said. "The use of microwave weapons is highly problematic for a plane with a pilot due to the need to preserve his life. But if we develop an additional system of protection against our own microwave weapons, we’ll lose even more space and the weight margin. Besides, even the most complex and effective system can be insufficiently efficient," Mikheyev said. Russia’s sixth-generation combat plane that will replace the T-50 fighter will be able to make radar photographs of enemy aircraft and determine their type and armament without the involvement of human operators, the KRET adviser said. According to him, KRET is developing a radio-photonic locator for the future combat plane. The company already has its experimental prototype and is creating its full-scale mockup. A new radar system will considerably surpass all existing radars by its power and range, he said. "The radio-photonic radar will be able to see farther than existing radars, in our estimates. And, as we irradiate an enemy in an unprecedentedly wide range of frequencies, we’ll know its position with the highest accuracy and after processing we’ll get an almost photographic image of it - radio vision," Mikheyev said. As the KRET adviser said, "this is important for determining the type [of an aircraft]: the plane’s computer will immediately and automatically identify a flying object, for example, an F-18 with specific types of missile armament." The new radar will also have better anti-jamming capabilities through its ultra-wide band and the huge dynamic range of its receiver. It will also additionally perform electronic warfare missions, transmit data and serve as a means of communication. The sixth-generation fighter jet will also get "a powerful multi-spectral optical system operating in various ranges - the laser, infrared, ultraviolet and, actually, in the optical band, which, however, considerably exceeds the spectrum visible to humans," Mikheyev said. This new optic system will supplement the radio-photonic radar, he noted. KRET has developed the experimental prototype of the radio-photonic radar for the sixth-generation fighter jet. The prototype transmits, receives and processes the signal, Mikheyev said. According to the KRET adviser, work has progressed on developing onboard radio-electronic equipment for the sixth-generation aircraft, in particular, the radio-optical photonic antenna array of its onboard locator. "Both the emitter and the receiver have been built on the basis of the experimental prototype as part of the R&D work. All this works and performs the location - we emit an ultra-high frequency signal, it is reflected back and we receive and process it and get the radar picture of an object. We see what we need to do to make it optimal," he said. "Now a full-fledged mockup of this radio-optical photonic antenna array is being developed as part of the research and development work, which will allow us to test the characteristics of the serial prototype," the KRET adviser said. "We will be able to understand what it [the radar] should be, in what geometrical sizes and what its ranges and power should be," he noted. 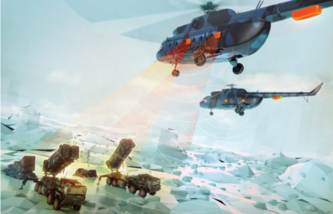 KRET is also testing the technologies of the new radar’s specific elements - its emitter, the photonic crystal, the receiving path and resonators, Mikheyev said. Russian Deputy Prime Minister Dmitry Rogozin in charge of the defense sector announced in March 2016 about the commencement of work on the sixth-generation fighter jet. As Head of the Directorate for Military Aviation Programs at the United Aircraft Corporation Vladimir Mikhailov told TASS in June last year, the Russian sixth-generation fighter jet prototype would perform its debut flight before 2025. 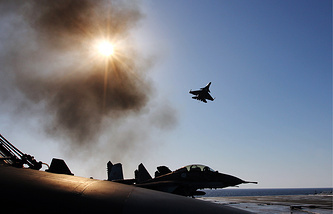 In a previous interview with TASS, KRET Adviser Mikheyev said that the new combat plane would come in two variants - the manned and unmanned versions. New fighters will operate in a ‘formation’ led by a piloted plane. Drones will be able to carry electromagnetic guns, fly at hypersonic speed and go into the outer space. This time, Mikheyev added that the unmanned variant would get maneuverability unavailable for piloted aircraft, which are limited by the human’s ability to withstand overloads. While both the manned and unmanned variants will be made on the same basis, they will differ by their armament, equipment and external outlook, he said.